The most precious of all the precious metals, Pure Platinum doesn’t disappoint with bright fun graphics, a 5-reel, 40-payline format and a 40,000-coin jackpot. The metal may be very precious, but there are huge win potential with every single spin and you can participate in the abundance. Pure Platinum Microgaming slot has a betting range from 1 up to 400 coins (0.01 – 20.00 euro). Taking into account this fact, players of all wallets can enjoy this exciting and rewarding slot machine. Wild symbols that are stacked on all reels in both the base game and during Free Spins. 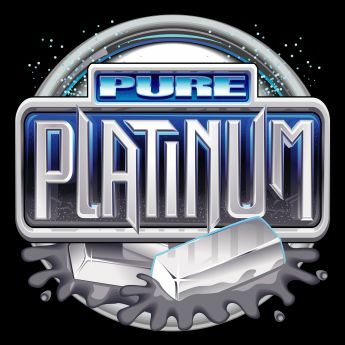 The Pure Platinum logo is the Wild and substitutes for all other symbols in the game to create winning combinations. It does not replace Scatter symbols. Hit 5 Wilds in one of the pay lines and win 10,000 extra coins. The appearance of the three or more platinum record Scatter symbols will trigger a Free Spins select screen where players will have the option to select: 50 Free Spins with a 1x multiplier, 25 Free Spins with a 2x multiplier or 10 Free Spins with a 5x multiplier. Any of these features can boost a players payout. Following any win on Pure Platinum, players can opt to gamble their winnings. A playing card are random, and your task is to predict the colour or kind of the cards. The gamble feature will double or even quadruple a players win amount. The Pure Platinum video slot also offer jackpot win but it’s quite low. The highest jackpot prize is just 1,000 coins. Although this may not sound very appealing, with the numerous paylines available to gamers, you can hit the main prize very often. If you want to play Pure Platinum slot and win decent money you should play at reputable Microgaming Casinos. A full list of reviews and verified brands you can find under our Top Menu: free spins, no deposit bonuses, mobile casinos, etc. Start playing your favourite precious metal slot and wealth and riches are sure to follow! No download is needed!